A man with a club under his arm holding the tether of a cow being milked, looking towards other men out of frame to the left. This man can also be seen in other images of a sheep sacrifice at Yakwach. It was considered ritually dangerous for men to milk a cow unless no women or children were available, such as on a journey. Although Evans-Pritchard captioned this image as being taken among the Gaajok, it is in fact the Lou cattle camp of Yakwac which he revisited in 1935. Research publication - Both the book plate spread (Figure 1, page 326) and the plate (Figure 19, page 336) are reproduced in B. Wolbert 'The Anthropologist as Photographer: the Visual Construction of Ethnographic Authority', Visual Anthropology , 2000, Vol 13, pp. 321-343. It is also reproduced (Figure 2, page 7) (and Wolbert's analysis criticised) in Christopher Morton, 'The Anthropologist as Photographer: Reading the Monograph and Reading the Archive', Visual Anthropology , 2005, Vol 18 (4) pp.1-17. Note on print reverse ms pencil - "64 A183 [with printer's crop marks]"
Morton, Chris. 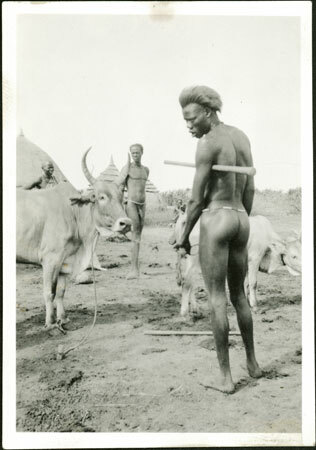 "Nuer man holding a restless cow" Southern Sudan Project (in development). 03 Jan. 2006. Pitt Rivers Museum. <http://southernsudan.prm.ox.ac.uk/details/1998.355.131.2/>.